You may be surprised to learn that many of today’s big actors had their first appearances as Star Trek Characters! At just 11 years old, the lovely Kirsten landed herself a role on the seventh season of The Next Gen. She played a Star Trek character called Hedril who was from a telepathic alien race known as the Cairn. The Rock played a Pendari Champion in Voyager who manages to beat the adopted Borg, Seven Of Nine in a battle of combat. This was one of Dwayne’s first acting parts which helped put him on a successful acting career. Dutch actress Famke played Kamala in the fifth season of Star Trek TNG who ends up marrying Captain Picard. She was later offered the role of Jadzia Dax in the Star Trek: Deep Space Nine series but turned down the role to concentrate on movie appearances. The creator of Family Guy and American dad has always been Trekkie and was thrilled to star in two episodes of the Star Trek series Enterprise. Seth’s character was a Star Fleet engineer called Ensign Rivers. The singer legend had a guest appearance in an episode of DS9. Iggy played a Vorta alien called Yelgrun who was the handler for a prisoner exchange between Ishka and Keevan. The King of Jordan is a huge fan of Star Trek and was given brief non-speaking appearance on Voyager as a surprise treat. he is currently helping to bring about the creation of a Star Trek theme park. Kelsey is most famous for playing Dr. Frasier Crane on the comedy series Cheers and Frasier. 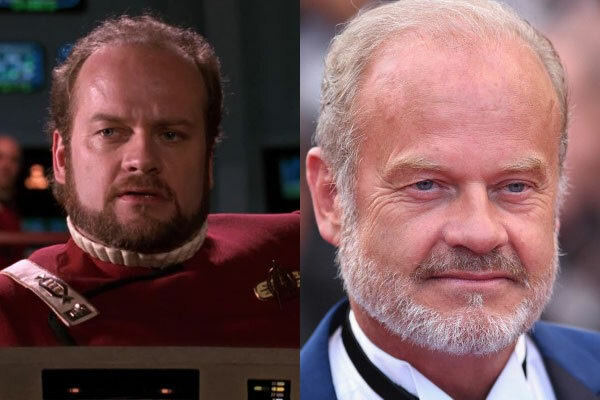 In 1992 he played the role of Captain Morgan Bateson who was commanding a Starship. Everybody remembers Terry O’Quinn from the series lost but very few remember his role as Admiral Erik Pressman in Star Trek. What’s even more shocking is that Terry played Riker’s much older superior officer but he is actually only one month older than actor Jonathan Frakes. Teri played transporter operator, Lieutenant B.G. Robinson on the TNG. The actress requested her name be removed from the credits and was then given the title – “Very Feminine And Graciously Endowed”. The American comedian landed herself a role on a special two part epissode of voyager. Sarah played a young Scientist called Rain Robinson who the crew of Voyager encounter when thrown into the past.